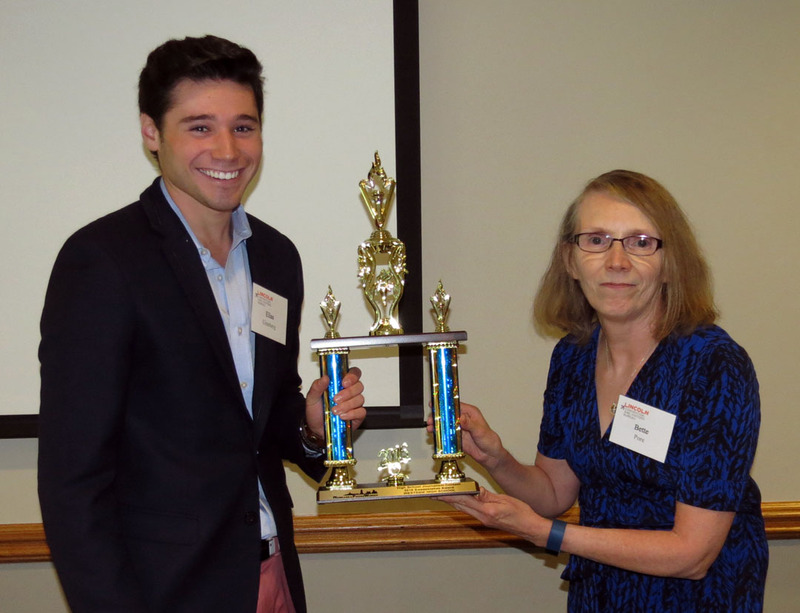 Elias Ginsberg accepts Omaha Westside High School’s sweepstakes award from Bette Pore, contest chair. LINCOLN — Nebraska high school journalism students were honored Saturday, April 23, with awards in the 2016 Nebraska Press Women High School Communications Contest. 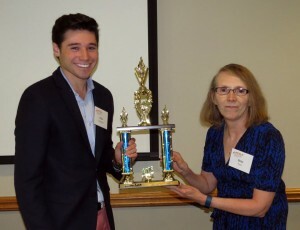 The awards were presented at the Nebraska Press Women Spring Convention at the Nebraska Union on the University of Nebraska-Lincoln City Campus. The contest includes categories for student newspaper, yearbook, broadcasting and online video work. Westside High School received the Sweepstakes Award for the second consecutive year. First-place winning entries have advanced to the National Federation of Press Women High School Communications Contest, with awards in that contest to be announced this summer. Editorial —Tessa McLaughlin, Marian High School, first; Rae Rangel, Bellevue West High School, second; Madigan Brodsky, Westside High School, third. Opinion — Nicole Saner, Westside High School, first; Libby Seline, Westside High School, second; Celena Shepherd, Westside High School, third; Mitchell Francis, Westside High School, honorable mention; Emma Korengel, Westside High School, honorable mention. News Story — Libby Seline, Westside High School, first; Emma Redinger, Hastings Senior High School, second; April Van Unen, Westside High School, third; Em Brandon, Bellevue West High School, honorable mention; Megan Fisher, Fremont High School, honorable mention; Riley Nelson, Hastings Senior High School, honorable mention; Michael Collicott, Hastings Senior High School, honorable mention; Olivia Nicolarsen, Hastings Senior High School, honorable mention. Feature Story — Natalija Ward, Westside High School, first; Jace Wieseler, Westside High School, second; Bridget Mizener, Westside High School, third; Celena Shepherd, Westside High School, honorable mention. Sports Story — Megan Fisher, Fremont High School, first; Kortney Buresh, Bellevue West High School, second; Brenden Holling, Northwest High School, third; Riley Nelson, Hastings Senior High School, honorable mention; Codi Pierce, Bellevue West High School, honorable mention. Columns or Blogs — Daniela Villabona, Grand Island Senior High School, first; Patience Jurgens, Bellevue West High School, second; Collette Gillaspie, Marian High School, third; Emma Redinger, Hastings Senior High School, honorable mention; Joshua Andersen, Johnson-Brock High School, honorable mention. News or Feature Photo — Hannah Bowes, Westside High School, first; Riley Nelson, Hastings Senior High School, second; Emma Larson, Bellevue West High School, third; Laura Gamboa, Grand Island Senior High School, honorable mention. Sports Photo — Codi Pierce, Bellevue West High School, first; Madigan Brodsky, Westside High School, second; Abby Lang, Westside High School, third. Cartooning — Marco Garcia, Grand Island Senior High School, first; Evelyn Mercado, Grand Island Senior High School, second; Diane Naughton, Fremont High School, third; Moises Zumaya, Grand Island Senior High School, honorable mention. Review — Libby Seline, Westside High School, first; Emma Larson, Bellevue West High School, second; Joshua Andersen, Johnson-Brock High School, third; Melissa Irish, Bellevue West High School, honorable mention. Graphics/Photo Illustration — Diane Naughton, Fremont High School, first; Ally Hermanek and McKenna Simpson, Marian High School, second; Jacob Kunes, Bellevue West High School, third; Emma Redinger, Hastings Senior High School, honorable mention. Single-page Layout — Rae Rangel, Bellevue West High School, first; Emma Larson, Bellevue West High School, second; Laura Gamboa, Grand Island Senior High School, third. Double-truck Layout — Jenna Hynek, Westside High School, first; Bria Menagh, Grand Island Senior High School, second. Best Newscast: Radio or Television — Christian Ellsworth, Katelyn Archer, Coleman Cooper, Austin Dammann, Mitchell Evans, Blake Gustafson and Katherine Smallwood, Northwest High School, first. Video News Story — Grace Ward, Westside High School, first; Lexy Burroughs and Kyla Jackson, Bellevue West High School, second, tie; Katie Ryckman and Christian Hiltbrunner, Bellevue West High School, second, tie. Video Feature Story — Elias Ginsberg, Westside High School, first; Jacob Blaha, Erin Chance and Rae Rangel, Bellevue West, second; Grace Ward, Westside High School, third; Avery Haselden and Erin Chance, Bellevue West High School, honorable mention; Coleman Cooper, Northwest High School, honorable mention; Phoebe Placzek, Westside High School, honorable mention; Aliyah White, Westside High School, honorable mention; Mitchell Evans, Northwest High School, honorable mention. Video Sports Story — Mitchell Francis and Jack Zipay, Westside High School, first; Grace Ward, Westside High School, second; Hannah Stodolka, Westside High School, third; Kyla Jackson, Jenna Hammond and Sam Herall, Bellevue West High School, honorable mention; Avery Haselden and Lexy Burroughs, Bellevue West High School, honorable mention. Yearbook Layout — Abby Lang, Westside High School, first; Zoey Cook and Taylor Hinrichs, Hastings Senior High School, second; Em Brandon, Bellevue West High School, third; Emma Larson, Bellevue West High School, honorable mention; Abbey Hansen, Grand Island Senior High School, honorable mention; Kelsey Ripperger and Amanda Karr, Hastings Senior High School, honorable mention; Kierstin Curtis, Hastings Senior High School, honorable mention; Chloe Swoboda and Murphy Glen, Hastings Senior High School, honorable mention. Yearbook Photo — Zoey Cook, Hastings Senior High School, first; Bree Fluckey, Hastings Senior High School, second, tie; Gauret Stearns, Bellevue West High School, second, tie; Patience Jurgens, Bellevue West High School, honorable mention; Ariana Luna, Grand Island Senior High School, honorable mention; Veronica Ontiveros, Grand Island Senior High School, honorable mention; Alondra Zapata Gonzalez, Grand Island Senior High School, honorable mention; Rhett Milner, Grand Island Senior High School, honorable mention; Hannah Bowes, Westside High School, honorable mention; Tashia Naslund, Hastings Senior High School, honorable mention; Bri Cleveland, Grand Island Senior High School, honorable mention. Yearbook Copywriting — Jaydn Bernt, Fremont High School, first; Cora Peterson, Bellevue West High School, second; Veronica Ontiveros, Grand Island Senior High School, third; Kelsey Ripperger, Hastings Senior High School, honorable mention; Chloe Swoboda, Hastings Senior High School, honorable mention; Katie Fast and Bree Fluckey, Hastings Senior High School, honorable mention.